I saw this picture recently. 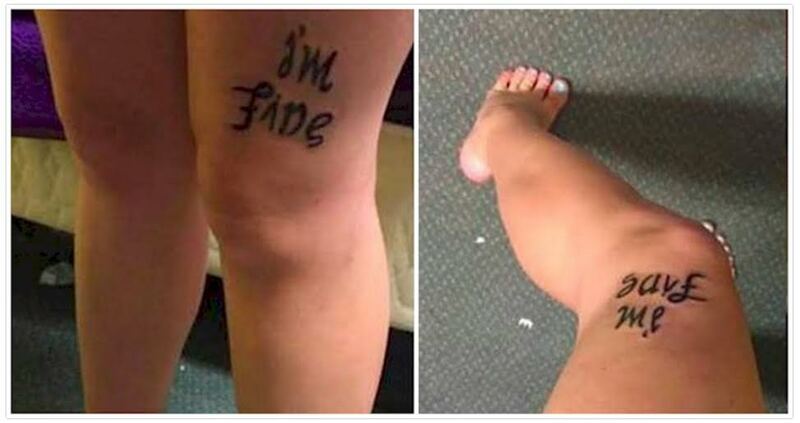 The title of the article is “Her tattoo contains a hidden message, and it started an important conversation.” The tattoo is an ambigram – a message that can be read upside down as well as right-side up. In this case, the message is different when read upside down. The normal way it is viewed by others says “I’m fine”, while the way that she sees it says “Save me”. The article says that she got it as a way of dealing with her depression. It is her way of asking for help. But there is something very wrong about this. It is passive. Help does not come from other people. If you give away your power to others, you will continually feel powerless. I find it significant that “Save me” is the view from her perspective. Maybe she will finally read it that way – that she is the only one who can save herself. She is the one who makes choices. learn to speak her truth. Being healthy is a choice, and something each person must do for themselves. Depression is a symptom, not a disease. It is the result of feeling powerless, disconnected, alone. It is a sign of not owning your own power, using your own voice. The way out of it is not to ask others to save you, but to save yourself. If others have to rescue you, you aren’t healed. They cannot do your work for you. The giving away of power to others is part of the disease, the dis-ease. Ease, comfort, health, comes from taking responsibility for your own life. You can ask for help to learn different ways of healing yourself, but you cannot expect others to do it for you. You must own your own power. You must be your own best friend. You must save yourself. This is the cure. Stop being passive about your life. Stop expecting others to rescue you. This entry was posted in Survival and tagged choice, codependency, depression, disease, empowerment, healing, passive, personal power, power, self-care. Bookmark the permalink. It took time before I learned that. I read also the book of Melody Beattie and they helped.Learning to love ourselves is the greatest love of all. Thank you for your post, I was reminded again. Thank you for taking the time to tell me that it helped. I think that is what we all do – remind ourselves and each other of truth.